I do not have any pictures of the firing pin but it is just a black rod with a blue spacer, an orange connector and tape.You have to tie a string to through the loop or connect a yellow rod to the back of the orange connector and tape it. this is one amazing gun. 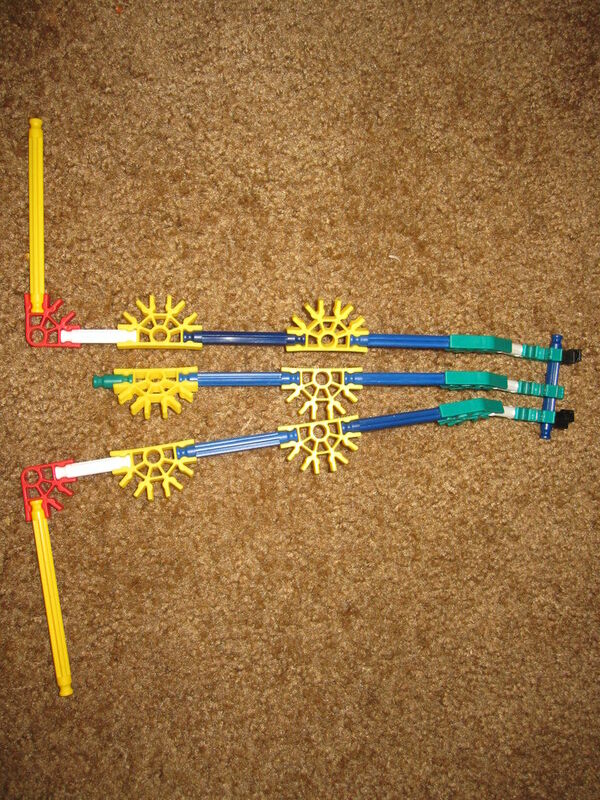 It looks EXACTLY like the real Thompson, except it's made out of knex!!! pretty neat gun aint it! This gun is really old and there are alot of things I could have made better, like the stock connection and ram, but I guess its pretty good looking. I might make a newer version soon though. But now that I look at it there are many things I could improve. Is the orange flexi rod the same as the red flexi rod? I'm not sure but it is the same size as a yellow rod. Don't thompsons have drum mags? There are two different versions of thompsons and this one doesnt have a drum mag the other kind also has different sites and a forward grip. ones a WWI version with the charging handle on top and WWII is with on the side, the forward grip & drum mag are attachments, they can have a normal wooden block or handle. THe thompson never existed during WWI, the thompson was in developement during WWI and first came into production in 1921. You also cant attatch a forward grip to a WWII era Thompson. No. I was trying to explain to you that they are manufactured with or without a vertical grip, and you cannot attatch one to it later on, therefore it is not an attatchment.